UCL Engineering’s Learning Technologists have been supporting rapid changes within the faculty. Changes include the development of several new programmes and helping the uptake of technology to improve the turnaround of feedback. In late 2013, the UCL Engineering faculty invested in a Learning Technologist post in order to support the Integrated Engineering Programme (IEP), as well as the other programmes within Engineering departments. Since then two Engineering departments, Science, Technology, Engineering and Public Policy (STEaPP) and Management Science and Innovation (MS&I) have both employed Learning Technologists to help develop their e-learning provision. These posts have had a significant impact on the e-learning activities. To evaluate impact on the student learning experience we are collecting information and feedback from students throughout the academic year. These three roles complement the UCL-wide support provided by the E-Learning Environments (ELE) team and the Learning Technologists work closely with the central ELE team. This relationship is facilitated by Jess Gramp, the E-Learning Facilitator for BEAMS (Built Environment, Engineering, Maths and Physical Sciences) who co-manages these roles with a manager from each faculty/department. This arrangement enables both formal input from ELE to the departmental activities and plans; and for the learning technologists to receive central mentoring and assistance. Without this structure in place it would be difficult to keep these roles aligned with the many central e-learning initiatives and for the learning technologists to liaise with the technical teams within ISD. The initiatives developed by these staff include: designing and implementing Moodle course templates; ensuring adherence to the UCL Moodle Baseline; running training needs analysis and developing staff training plans; delivering e-learning workshops; working with staff to redesign courses, as well as developing them from the ground up, to incorporate blended learning principles; delivering one-to-one support; and working with academics on e-learning projects. 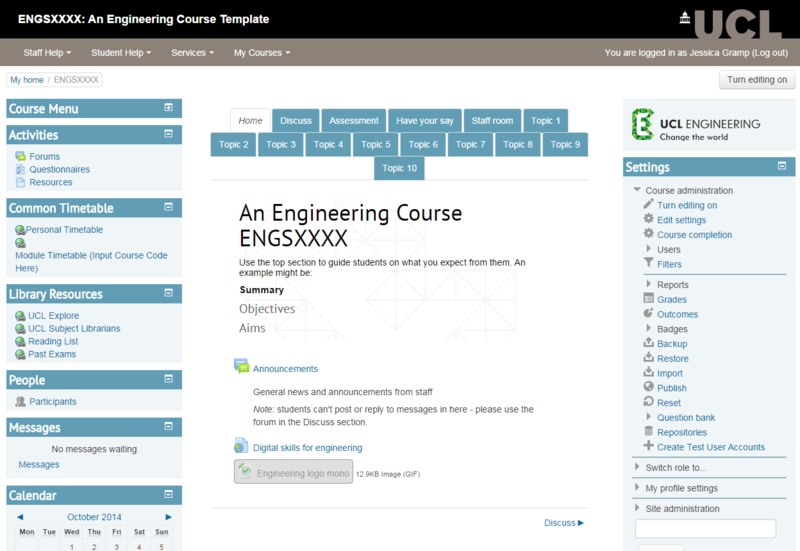 Engineering now have a Moodle template that provides a consistent experience for students using UCL Moodle to support their learning. 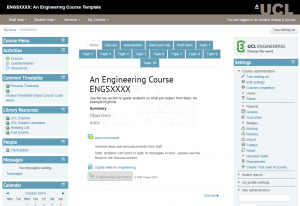 This template is now being used on all IEP, MS&I and STEaPP courses and all new Engineering Moodle courses from 2014/15 onwards will also use this template. In some cases the template has been modified to meet departmental requirements. See how MS&I have modified this template and described each feature in their MS&I Moodle Annotated Template document. In MS&I all Moodle courses have been audited against the UCL Moodle Baseline. This has enabled the department’s Learning Technologist to modify courses to ensure every course in the department now meets the Baseline. The template document that was used to audit the courses has been shared on the UCL E-Learning Wiki, so other departments may use it if they wish to do similar. You can also download it here: Baseline Matrix MSI-template. In STEaPP a Training Needs Analysis was conducted using both a survey and interviews with academics to develop individual training plans for academics and run training workshops specific to the department’s needs. The survey used for this has been shared with colleagues on the UCL E-Learning Wiki. In STEaPP a Moodle Staff Hub course has been developed to support staff in their development of courses, including links to e-learning support materials; curriculum development advice; and links to professional development resources. This course has now been duplicated and modified to assist staff across Engineering and within MS&I. If any other UCL faculties or departments would like a similar course set up they can request this be duplicated for them, so they may tailor it to their own requirements. This and other courses are being used to induct new staff to departments and are supported by face to face and online training programmes. The training is delivered using a combination of central ELE training courses and bespoke workshops delivered by Engineering Learning Technologists. In MS&I the average turn around for feedback to students is now just one week, significantly shorter than the four week target set by UCL. In order to support this initiative, the department has adopted a fully online assessment approach. This has been achieved predominately using Turnitin, a plagiarism prevention tool that also provides the ability to re-use comments; use weighted grading criteria to provide consistent feedback to students (in the form of rubrics and grading forms); and mark offline using the iPad app. The use of this tool has helped staff to reach the one week feedback target and to streamline the administrative processes that were slowing the feedback process. The Learning Technologist in MS&I has recently arranged workshops with the majority of MS&I staff (including those who are new to UCL) to demonstrate how Turnitin can be used to deliver feedback quickly to students. Several modules within the IEP are also using Moodle’s Workshop tool to enable peer assessment to be managed automatically online. The use of this and other e-assessment tools is saving academics and support staff significant time that used to be spent manually managing the submission, allocation and marking of assessments. While the ELE Services team continues to be the main point of contact for technical e-learning support within Engineering, the local Learning Technologists are able to provide just-in-time support for staff working on local projects. The Learning Technologists are also able to provide assistance beyond what is supported by the central E-Learning team. This includes any development work, such as setting up specific tools within Moodle courses (like the Workshop tool for peer assessment) and setting up groups in MyPortfolio. Development work like these activities fall outside the remit of the central E-Learning Environments team. Also, because the Engineering Learning technologists are based within the faculty, they obtain a better knowledge of local working practices, and are therefore better equipped to understand and support department specific requirements than the central team is able to. The local Learning Technologists have worked with academics within Engineering to develop bids for Engineering Summer Studentships and other projects, including the E-Learning Development Grants that are distributed yearly by ELE. The successful project proposals have been supported by the local Learning Technologists, which has meant a greater level of support has been provided to the grant winners than has been possible in previous years. The Learning Technologist for STEaPP had a unique opportunity to work with staff during the development of their curriculum to ensure that technology was considered at the very outset of the programme’s development. In MS&I the local Learning Technologist has helped to develop a scenario-based, blended-learning course that is now being used as an exemplar of how other academics may redesign their own courses to empower students in their own learning (both electronically and face to face) and provide authentic learning experiences. Many Engineering programmes are already using project-based work to provide students with authentic learning experiences and assessments and this is something the Learning Technologists can work with academics to develop and enhance further. Several e-learning systems have been trialed within Engineering significant input from the Engineering Learning Technologists, including the mobile e-voting system (TurningPoint ResponseWare) for up to 1000 students; and peer assessment of upwards of 700 student videos within the IEP. The successful implementation of such large scale trials would have been difficult without the support of the Learning Technologists. One of the common problems with technology uptake is ensuring staff have access to it. Engineering have invested in a number of devices to enable (amongst other things) offline marking; video capture and editing; and presentation of hand drawn figures during lectures. Equipment is available for loan across Engineering and also within STEaPP and MS&I. These include laptops, video recording and editing kit (such as cameras, tripods, microphones and editing software) and iPads. The maintenance and loaning of these are managed by the local Learning Technologists. They are also able to provide advice and assistance with the use of these devices, especially in terms of multimedia creation, including sound recording and filming, and editing of videos to enhance learning resources. One important aspect of these roles is that they have close ties to the ELE team, allowing for important two way communication to occur. The Engineering Learning Technologists are able to keep abreast of changes to centrally supported processes and systems and can obtain support from the central E-Learning Environments Services team when required, including receiving train-the-trainer support in order to run workshops locally within Engineering departments. Similarly, ELE benefit by an improved understanding of the activities occurring within faculties and departments, and accessing the materials that are developed and shared by the Learning Technologists. Each week the Engineering Learning Technologists share any developments, issues, and updates with each other and the E-Learning Facilitator for BEAMS. The result is a strong network of support for helping to problem solve and resolve issues. It also enables resources, such as the staff hub Moodle course and Moodle auditing matrix, to be shared across the Faculty and more widely across UCL, enabling the re-use of materials and avoiding duplication of effort. The importance of the strong working relationship between the Engineering Learning Technologists became apparent during UCL Engineering’s How to change the world series. During an important final-day session all three Learning Technologists were involved in resolving technical issues to ensure the voting system operated correctly in a venue with incompatible wireless provision. UCL staff and students today operate within a rapidly changing educational environment. Both staff and students are expected to understand how to use technology in order to operate within an increasingly digital society. There is a huge number of self directed online learning resources available (such as MOOCs and YouTube videos) and increasingly flexible work and study arrangements are being supported by enhanced technology use. As more staff see the benefits that technology can bring to the classroom, and true blended learning becomes the norm in many areas, it is going to be more important to implement appropriate support structures so staff have the resources to understand and work with these emerging technologies. It is equally important that students are supported in their use of these tools. The Learning Technologists within Engineering are in a unique position to understand the opportunities and issues arising in the classroom, and react to these quickly and effectively. We have already seen numerous outputs from these roles. These include a video editing guide to help academics produce professional looking videos for their students; the use of tools within Moodle and MyPortfolio on a scale not seen before with large cohorts of over 700 IEP students; and an exemplar of how scenario-based learning can be supported by technology in MS&I. While these outputs have been developed in reaction to local needs, they have been shared back for others to use and reference, and therefore they benefit the wider UCL community. As we see more of these roles implemented across UCL, we will begin to see more dramatic change than has been achievable in the past. One of the plans for the future involves running student focus groups and interviews to better understand how Moodle and other e-learning systems are helping students with their studies and how provision can be improved. The Engineering Learning Technologists will continue their work with local staff to help their departments to use technology more effectively and improve the student experience.